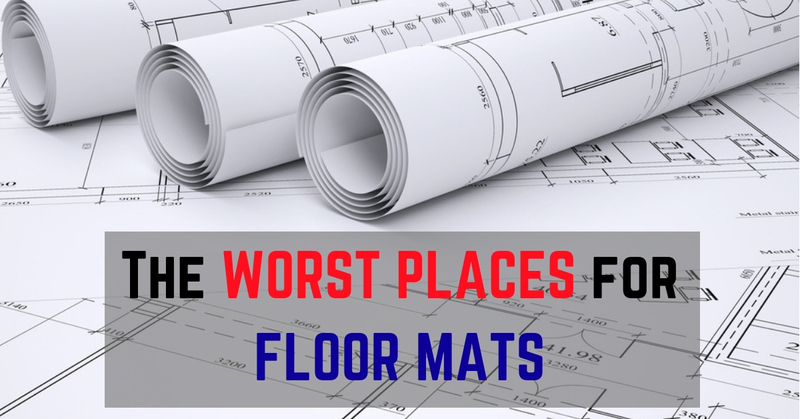 The right type of business floor mats is only as good as where you actually place them – and these are the worst places to put your floor mats! When it comes to the “where” of business floor mats, there are two things to keep in mind: purposefulness and effectiveness. This is what separates a sound floor mat investment from a complete waste of money. Purposefulness means you have floor mats in an area that actually has use for them while effectiveness refers to whether or not the kind of business floor mats you have actually meets the specific needs of said area. 1. Areas with a low volume of foot traffic. Floor mats serve various needs, but primarily they provide a layer of protection against the wear and tear that comes with the volume of foot traffic. They not only drag along dirt, debris, and moisture, but foot traffic also causes deterioration on the upper layers of the floor, causing it to look less than ideal after a certain period of time has passed. Without heavy and regular foot traffic, there is virtually nothing to protect your floors from. A great way to gauge whether or not an area needs business floor mats is to assess the volume of foot traffic it gets and the levels of exposure to dirt and moisture. Floor mats placed at the top of stairs are fall hazards. This is especially true of poor-quality business floor mats as well as poorly-maintained mats with higher possibilities of curling at the edges that can cause trips and result in dangerous fall injuries. 3. Areas that have specialized matting needs. There is little room for doubt when it comes to the usefulness of commercial floor mats. However, not all mats are made for the same purpose and when they get placed in the wrong area will prove of little to no help at all. For instance, a regular commercial mat would not be as helpful on a highly greasy floor like a restaurant kitchen’s, and neither would a highly specialized anti-fatigue mat be of any use at a business entrance to keep dirt and moisture out. In both of these illustrations, the mats do not serve the specific purpose the area requires and prove to be a waste. Choose mats according to purpose. A rule in picking mats is to put function over form every time. Identify the specific need in a specific area and decide whether you need dirt-removing scraper mats, ergonomic anti-fatigue mats, or wetproof mats, etc. Identify areas with heavy foot traffic. These areas include workstations, entrances, and busy hallways. The floor surfaces on these areas get the most beating and therefore need more significant matting protection. Only pick high-quality business floor mats. When it comes to protecting your floors and your employees and clients, there is no better choice than high-quality business floor mats. Poor quality mats do not just fail to deliver your needs for durability – they may even be ineffective in delivering their specialized purpose. For all your high-quality floor mat needs, trust only NDC! NDC is your number one source for a wide variety of business floor mats for all your facility’s needs. Our mats are carefully selected to meet the highest standards for slip resistance and optimum durability, designed to deliver your needs for quality. Contact us today at (800) 238-2387 to learn more about our mat rental program and get started!